Private First Class Frank H. Ono (5 June 1923 - 6 May 1980) was a U.S. Army soldier who was posthumously awarded the U.S. military's highest award for valor, the Medal of Honor, for his heroic actions during World War II. On 4 July 1944, Ono was serving as a Private First Class in the 442nd Regimental Combat Team. 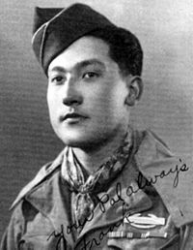 During a battle that day near Castellina, Italy, Ono advanced ahead of his unit and single-handedly defended his position against an enemy counter-attack. He then braved intense hostile fire to aid two wounded comrades and, when it became necessary to retreat, voluntarily covered his unit's withdrawal. For his actions during the battle, he was awarded the Army's second-highest decoration, the Distinguished Service Cross. A 1990 review of service records for Asian Americans who received the Distinguished Service Cross during World War II led to Ono's award being upgraded to the Medal of Honor. In a ceremony at the White House on 21 June 2000, his surviving family was presented with his Medal of Honor by President Bill Clinton. Twenty-one other Asian Americans also received the medal during the ceremony, all but seven of them posthumously. Citation: Private First Class Frank H. Ono distinguished himself by extraordinary heroism in action on 4 July 1944, near Castellina, Italy. In attacking a heavily defended hill, Private First Class Ono's squad was caught in a hail of formidable fire from the well-entrenched enemy. Private First Class Ono opened fire with his automatic rifle and silenced one machine gun 300 hundred yards to the right front. Advancing through incessant fire, he killed a sniper with another burst of fire, and while his squad leader reorganized the rest of the platoon in the rear, he alone defended the critical position. His weapon was then wrenched from his grasp by a burst of enemy machine pistol fire as enemy troops attempted to close in on him. Hurling hand grenades, Private First Class Ono forced the enemy to abandon the attempt, resolutely defending the newly won ground until the rest of the platoon moved forward. Taking a wounded comrade's rifle, Private First Class Ono again joined in the assault. After killing two more enemy soldiers, he boldly ran through withering automatic, small arms, and mortar fire to render first aid to his platoon leader and a seriously wounded rifleman. In danger of being encircled, the platoon was ordered to withdraw. Volunteering to cover the platoon, Private First Class Ono occupied virtually unprotected positions near the crest of the hill, engaging an enemy machine gun emplaced on an adjoining ridge and exchanging fire with snipers armed with machine pistols. Completely disregarding his own safety, he made himself the constant target of concentrated enemy fire until the platoon reached the comparative safety of a draw. He then descended the hill in stages, firing his rifle, until he rejoined the platoon. 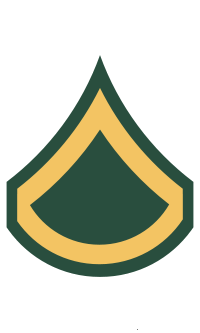 Private First Class Ono's extraordinary heroism and devotion to duty are in keeping with the highest traditions of military service and reflect great credit on him, his unit, and the United States Army. Ono left the Army while still a Private First Class. Private First Class Frank H. Ono died on 6 May 1980 at age 56. He is buried at Highland Cemetery in North Judson, IN, in Section 7, Lot 47.